Between our house project, client meetings, photo shoots and life in general, things have been go, go, GO lately! Hang with me--this weekend I have a three month old photo session with one of my favorite little fellas and also an engagement session which will include an awesome car and/or truck. I've got lots of ideas for these sessions so check back to see the results! There will also probably be some house updates soon--ya'll haven't even seen the second story! I'm way behind in keeping you posted--sorry! Here is a random picture for your Thursday night viewing pleasure--I'm off to go work on the house! I sure miss the summer time colors! 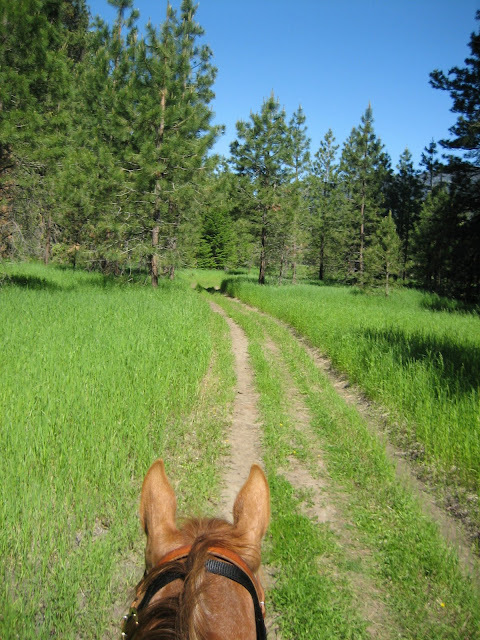 This is the view from Rascal's back on a trail ride in Eastern Washington last summer from my little point and shoot camera with no Photoshop work. I sure hope we can go again some day! Looking at the picture--I'm not quite sure why it looks like Rascal has a mohawk but I assure you he does not!